Jane’s Addiction will be performing tonight on the Late Show With David Letterman. No word on what song they’ll be playing but you can be sure it’ll be something from the new album The Great Escape Artist. Check you local listings for air time in your area. The Great Escape Artist – Out Now! 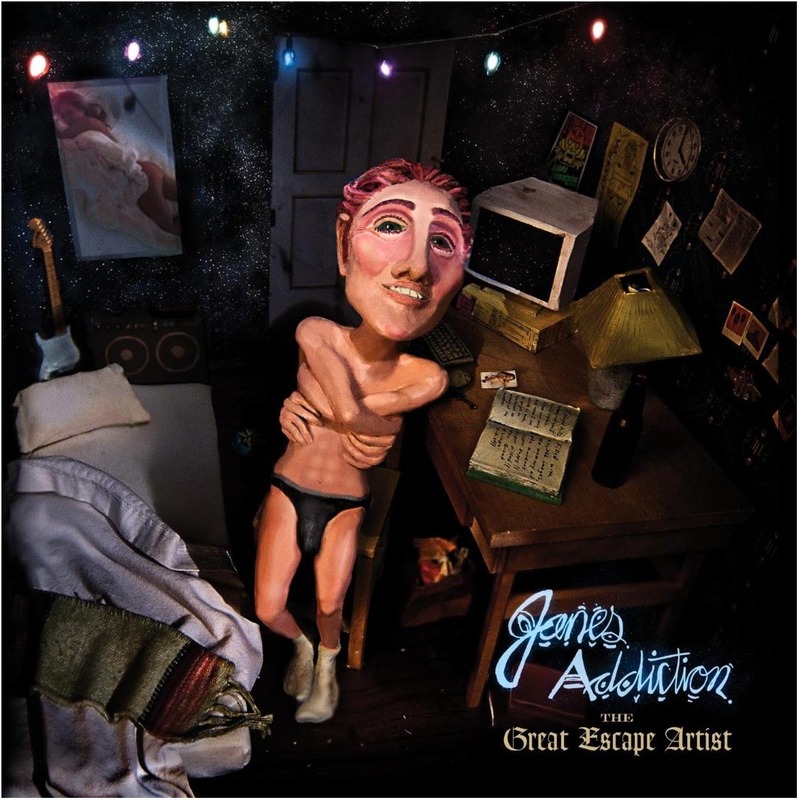 The fourth studio album from Jane’s Addiction, The Great Escape Artist is out NOW! So, what are you waiting for? If you haven’t already, go get it! Lollapalooza and Jane’s Addiction share intertwined legacies. With that in mind, Perry and the band have decided that it makes perfect sense that Lolla fans should get a special sneak-peek of the new album. After eight years, Jane’s Addiction fans can finally breathe a sigh of relief: on Tuesday, October 18th the band’s long-awaited new release The Great Escape Artist is hitting the streets. It was well worth the wait. Frontman Perry Farrel‘s forward-thinking musical ideas anchor the album while pushing the songs into daring new territory. His iconic vocals soar across the mix, perfectly counter-balanced by guitar god Dave Navarro‘s relentless, psychedelic shred. On drums, Stephen Perkins‘ propulsive tribal stomp is nothing less than hypnotic. Along with a talented creative team, including producer Rich Costey (Muse, Franz Ferdinand, Interpol) and TV on the Radio’s multi-instrumentalist Dave Sitek on bass, the new LP blazes brave, new trails for the alt-rock pioneers. Together, these massive talents have architected another timeless record by simply doing what they do best – being real. The band wanted to treat the Lolla-Nation to a special sneak-peek of the new album, offering a free download of the groundbreaking opening track before it’s released tomorrow. So, without further ado, here’s Jane’s Addiction’s brand new single… Underground. Stream The Great Escape Artist Now! Jane’s Addiction have put up their entire album, The Great Escape Artist, on iTunes to stream for free! The album comes out next week and is available for pre-order on iTunes, Amazon and elsewhere. Jane’s Addiction is featured in this month’s issue of Music Connection. The band discusses a number of things surrounding the development of their forthcoming album, The Great Escape Artist, including getting back together with Eric Avery, Trent Reznor and Duff McKagan’s brief stint in the band. It’s an interesting read. You can check out the entire issue online for free at MusicConection.com. Back in April of 1989 Jane’s Addiction played a series of legendary shows at Los Angeles’ historic John Anson Ford Theatre. Now on October 3 and 4, 2011, front man Perry Farrell, guitarist Dave Navarro and drummer Stephen Perkins, along with Chris Chaney on bass, will return to this historic venue teaming up with Citi to play their ground-breaking classics and launch their long awaited new album, THE GREAT ESCAPE ARTIST, due out Tuesday, October 18 on Capitol Records. Amazon.com now has the following as the album cover for the upcoming Jane’s Addiction album “The Great Escape Artist”. On November 23 and 25, 1988, alternative rock pioneers JANE’S ADDICTION took to the stage of Chicago’s legendary Metro—the city’s destination for exciting new music–to launch their seminal, ground-breaking album Nothing’s Shocking. On September 24 and 25, 2011, frontman Perry Farrell, guitarist Dave Navarro and drummer Stephen Perkins, along with Chris Chaney on bass, will return to the venue partnering with Citi to launch their newest offering, THE GREAT ESCAPE ARTIST, now due out Tuesday, October 18 via Capitol. These Chicago dates mark the start of a one-of-a-kind series of two-night stands that will also take place in New York and Los Angeles. Citi® cardmembers will have access to presale tickets for the Chicago Metro shows beginning Tuesday, September 6th at 10AM central time through Citi’s Private Pass® Program. For complete presale details including exclusive VIP packages, custom launch show merchandise and unique opportunities to interact with the band visit www.citiprivatepass.com. Tickets go on sale for the Chicago Metro shows on Saturday September 10. Keep checking www.citiprivatepass.com, www.JanesAddiction.com and www.facebook.com/JanesAddiction for ticket information on Los Angeles and New York. Blabbermouth.net is reporting that the forthcoming Jane’s Addiction album The Great Escape Artist has been delayed a week and is now due on October 4, 2011. There has been no official word from the band confirming this. Update: The 1-week delay is official. JanesAddiction.com has been updated with the new released date.